Sasktip takes up the cause for Saskatchewan’s wildlife, fisheries, forestry, and environmental resources. 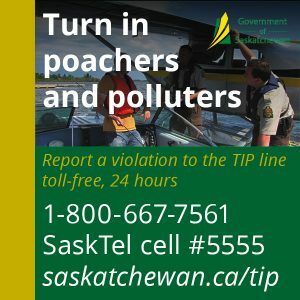 Sasktip is a registered charity which maintains a reward fund to assist in the apprehension and prosecution of those who violate resource and environmental laws. It was formed to help Conservation Officers in Saskatchewan convict poachers of all types. Sasktip works closely with Saskatchewan Conservation Officers, but is NOT a government entity. The organization relies on donations and grants to successfully operate and provide incentive for reporting poachers. The 24-hour Saskatchewan Turn In Poachers Line is monitored by the Ministry of Environment. Sasktip relays any information it receives to the proper authorities, but strongly advises you contact the TIP line directly to ensure your information is handled in a timely manner. Sasktip does not provide a 24-hour reporting service. Sasktip is comprised of volunteers from across the province of Saskatchewan. These dedicated volunteers are active members in their communities and stand up for Saskatchewan’s natural resources in their daily lives. Director – Ross Stewart has been a Federal Wildlife Officer for more than fifteen years for the Environment Canada’s Wildlife Enforcement Directorate in their Prairie and Northern Region based out of Saskatoon. He is currently the Manager of Operations for Prairie and Northern Region that includes the three prairie provinces. Ross was a Manitoba Conservation Officer for seventeen years and has been involved in Natural Resource law enforcement his entire career. Director – Kent F.R. Siegele is the Saskatchewan Operations Manager for Environment Canada’s Environmental Enforcement Division in their Prairie and Northern Region out of Regina. He has been an Environmental Enforcement Officer for Environment Canada since 2000 and prior to that was a Saskatchewan Conservation Officers for almost 20 years. Director – Chris Maier is the president of SACO and has been a Conservation Officers for several years. He is currently stationed in Saskatoon. Secretary – Daryl Minter is a past president of SACO and has been a Conservation Officers since 1980. He pioneered the K9 program for the Ministry of Environment and was a K9 handler for 14 years. He is currently the Inspector for the Saskatchewan Ministry of Environment Prince Albert Compliance Area. Treasurer – Terry Clifford has been a Conservation Officer for many years and is stationed at Candle Lake. Director – Glen Ungar is a lifelong member and former President of the Saskatoon Wildlife Federation. He is also a member of the Bridges SWF Organization. Director – Norm Nordgulen is the SARM Director for Division 2. He is an ardent Naturalist and Historian, as proven by the giving of an easement on his ranch to the Nature Conservancy of Canada to keep in it’s natural state for all time. Vice Chairperson – Ken Aube has long history with the Ministry of Environment working as a Conservation Officer and a Compliance Manager. He is currently the Director of Enforcement with Compliance and Field Services Branch, Ministry of Environment. Director – Rich Hildebrand has been a Conservation Officer with the Ministry of Environment for numerous years. Chairperson – Lorne Scott became the Nature Saskatchewan representative on the Board in early 2005. Lorne brings a wealth of experience to the organization, including his work as a past Minister of Saskatchewan Environment. Director – Hank Halseth is the owner and operator of Hank’s Concrete Service in Outlook. He is an avid bow hunter and currently sits as a director with the Saskatchewan Bowhunters Association. Director – Brian Hepworth is the Manager of Provincial Operations in Saskatchewan for Ducks Unlimited Canada. Director – Jeanette Krayetski has worked for the Government of Saskatchewan for over 30 years, with the majority of her career spent in the Ministry of Environment within the Wildfire Management, Compliance and Field Services Branches. Jeanette’s background in public and media relations has served as an asset in the production of the Sasktip Crime of the Month features, as well as the spokesperson for Sasktip Ads.